Troon North is the ultimate upscale community for luxury home buyers. It includes some of the finest homes in Scottsdale. Troon North is a prestigious master-planned community and is considered by many to be one of the best Scottsdale golf communities. The area is popular with golfers, vacationers and many other homeowners looking for a luxury lifestyle. There are Troon homes to suit a wide range of buyers, from sprawling upscale homes and brand new custom lots, to cozy condos and townhomes. Two golf courses meander through various subdivisions within Troon North, creating stellar views that can be enjoyed by many residents from their homes. Troon North real estate includes single-family residences from a number of different builders, as well as several custom homes and luxury condos. Now is your chance to join those who have discovered the homes of their dreams. Search Troon real estate for sale below to find the perfect home to suit your lifestyle. Contact Carmen Brodeur at (602) 791-0536 or email Carmen@TopScottsdaleHomes.com to schedule an appointment to view any Troon homes for sale. Troon North is proud to include a variety of custom, semi-custom and developer built homes. At over 1,800 acres, the celebrated golf community of Troon North wasn’t built overnight. This carefully thought out community has been developed and strategically improved upon since its beginnings in 1989. Troon homes are in harmony with the unique desert landscape and cater to the outdoor lifestyle of Arizonans.There are still properties available for brand new construction within Troon North. Troon North, is rated as one of North Scottsdale’s top golf communities, boasts two championship level courses: the Pinnacle and the Monument, developed by famed golf course designers Tom Weiskopf and Jay Morrish. Residents also have the ability to register for a membership to the Troon North Golf Club, available exclusively to Troon North property owners. The views of the vibrant green fairways are rivaled only by the landscape’s majestic boulders, saguaro cacti and stunning pink sunsets. 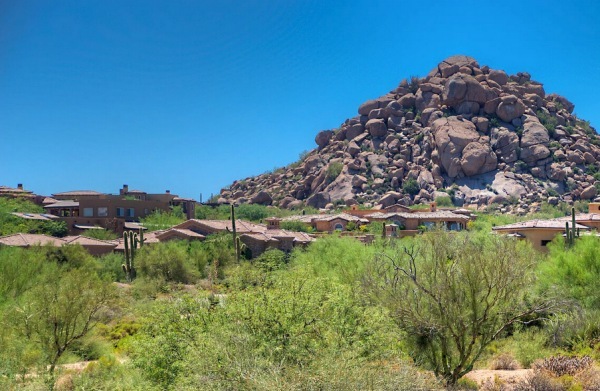 Troon North is also home to Pinnacle Peak, a Scottsdale landmark that rises from the desert, straight into the sky, giving most Troon homes a beautiful mountain view, as well as unparalleled hiking trails. Carmen Brodeur with Trillium Properties, is a top Scottsdale Realtor who specializes in golf communities including Troon North. Carmen would be happy to help you find the perfect home in Scottsdale. Please contact Carmen Brodeur at Carmen@TopScottsdaleHomes.com or (602) 791-0536 for more information.